This sixteenth-century painting from India shows Alexander the Great (356–323 B.C.E. ) being lowered in a glass diving bell. 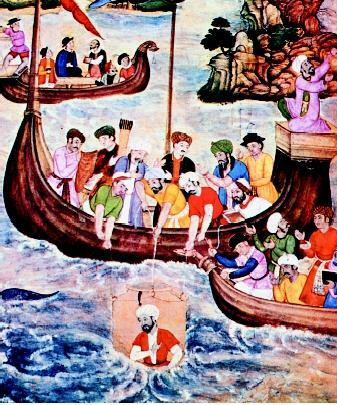 Historians believe that Alexander used diving bells in warfare. of steel or titanium; power and propulsion systems of nuclear energy or diesel fuel and electric batteries; internal air stores; periscopes; and weapons including torpedoes, mines, anti-ship and land-attack cruise missiles, and ballistic missiles with nuclear warheads. Though submarines seem to be modern inventions, their origin goes back to the fourth century B.C.E. when Greek historians said Alexander the Great's soldiers used "diving bells" for attacking underwater. Probably the first person to travel horizontally underwater was Dutch engineer Cornelis Drebbel. Around 1620, Drebbel built submersibles that resembled two wooden rowboats—one atop the other—made from grease-soaked leather stretched on a frame with oars stuck through waterproofed holes. Historians consider Drebbel's vessels the first practical use of a maneuverable submarine. Submarines built in the United States, England, France, Germany, and Italy were larger in size than predecessors, but were still primitive hand-powered ships, with rudimentary and often ineffective explosive weapons. David Bushnell's Turtle, shown in this 1776 illustration, was intended to attach explosives to British ships in the Revolutionary War. In 1776, Yale student David Bushnell built a submarine for the Americans during the Revolutionary War (from 1775 to 1783). 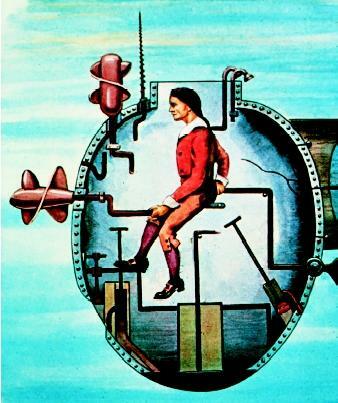 The egg-shaped submarine was hand-propelled by two crude propellers, one for back-andforth motion, and another for ascending-and-descending motion. The Turtle carried a powder charge (some say the world's first torpedo) into battle with the British man-of-war Eagle. The submarine sunk after numerous attempts to attach explosives to the ship's bottom. While studying in Paris in 1797, American inventor Robert Fulton developed the submarine Nautilus, a 6.5-meter (21.3-foot), cucumber-shaped vessel that contained the first "conning" tower (a glass eye for steering). Fulton adapted Bushnell's hand-turned propeller for power, but used compressed air to raise the vessel and as an oxygen supply, and rudders for vertical and horizontal control. Although the Nautilus destroyed an old French schooner, the country rejected his invention, as did England. Fulton eventually built an armored submarine for the United States that carried ninety men. Periscopes that allowed viewing of surface objects while shallowly submerged were added to submarines in the mid-1800s. 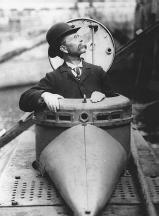 John Holland is shown in this 1898 photograph, sitting in the turret of an early submarine. His advancements eventually led to the world's first submarine fleet. Other than periscopes, only small technological advances were seen until the end of the American Civil War (from 1861 to 1865). American inventor Theodore Stoney designed an iron-plated torpedo boat, the David , whose mission was to destroy Union warships with its 15-foot hollow spar filled with blasting powder. Such submarines lacked adequate air and power supplies, and were unable to easily lift from the seafloor. After the Civil War, American inventor John Holland developed during 25 years of experimentation (beginning in 1875) the first practical submarine with an efficient power source: a dualpropulsion system with an air-breathing gasoline engine for surface running and a non-breathing electric battery system for traveling submerged. Holland's ninth submarine, the U.S.S. Holland, about 16.4 meters (54 feet) long, weighing 74 tons, and including a self-propelled torpedo, became the first submarine to become a regular part of the U.S. Navy. By 1903, the U.S. government gave Holland a contract for six more submarines, creating the world's first submarine fleet. By World War I (from 1914 to 1918), a submarine had been a weapon of war for over a century. Most industrialized countries had acquired a first generation fleet of crude but effective diesel-electric submarines with torpedoes that could strike from 3 kilometers (2 miles) away, far-seeing periscopes, and diesel engines. The new engine, invented in 1892 by German engineer Rudolf Diesel, proved to be cheaper, more efficient, and less dangerous to run than gasoline. Diesel gave submarines the ability to safely operate for long time lengths and hundreds of miles offshore. However, using diesel required air, so submarines had to surface, exposing them to attack. On September 5, 1914, the German submarine U-21 sunk the British Pathfinder, the first ship successfully sunk by a fully submerged submarine. Another German submarine, the U-151, was one of the new classes of Uboats ( Unterseeboote, or undersea boats)—a forerunner of the submarine of the future. Between wars, scientists introduced the diesel-electric drive to replace the diesel engine. Instead of diesel engines driving electric motors on the surface, the diesels drove electric generators that provided power for electric motors, allowing more flexibility of motions. During World War II (from 1939 to 1945), submarines were improved with better engines and longer ranges. They were distinguished from the previous generation with the use of radar, a detection system that sent out pulses of high-frequency electromagnetic waves that reflected off the vessel back to the source. The modern generation of submarines is distinguished from conventional submarines in that they are not forced to surface frequently to recharge batteries. This feature, along with its massive size and thinner hull, all point to the concept of the nuclear submarine. Before World War II American engineers Ross Gunn and Philipp Abelson studied the use of atomic fission power to move torpedoes and submarines. After atomic bombs were dropped on Japan, the U.S. Navy, with the backing of Chief of Naval Operations Chester Nimitz, began to develop a "Jules Verne submarine." Captain Hyman Rickover, a Navy electrical engineer, realized the importance of uranium in order to harness the atom to drive submarines. Conventional submarines could not cruise for more than an hour submerged at their top underwater speed of 9 to 12 knots (10.4 to 13.8 miles per hour). The Nautilus could run for many hours at a speed from 16 to 20 knots (18.4 to 23.0 miles per hour). On the ship's first 100,625 kilometers (62,500 miles) of travel, the Nautilus used a single uranium core, the equivalent of 8,224,000 liters (2,170,000 gallons) of diesel oil. In August 1958 the Nautilus made the first undersea passage of the North Pole. Traditional submarines sank enemy ships with torpedoes that were horizontally sent through waters. It was decided that nuclear submarines would also be able to send their explosives vertically through the water to strike far inland. On July 20, 1960, the first missile, the Polaris , was fired off Cape Canaveral from the George Washington, a new missile-bearing nuclear submarine. The submarine had now become the world's most powerful weapon, able to deploy nuclear warheads that flew 2,250 kilometers (1,400 miles) in 17 minutes. The military purpose of submarines expanded into scientific missions beginning in the 1960s. The world's smallest nuclear submarine, NR-1 , was built in 1969 to provide military surveillance and marine research at midocean depths of 900 meters (3,000 feet). Divers sometimes live extended periods of time in a pressurized chamber, called an underwater habitat. The habitat allows for long-term and continuous scientific observations and experimentations to be conducted underwater. One of the most famous habitats was the Hydrolab of the National Oceanic and Atmospheric Administration. Based in the Bahamas and Caribbean, Hydrolab was the only habitat to operate at one atmosphere . In its 15 years of operation, no serious hyperbaric accidents occurred. Its success lay in its simple design and expert support personnel. Hydrolab scientists were among the first to observe mass mortality of the sea urchin Diadema antillarum in the greater Caribbean in the early 1980s. Alvin, Argo, Jason. Constructed in the early 1960s for the U.S. Navy, DSV (Diving Support Vehicle) Alvin was a three-person, self-propelling, capsulelike submarine nearly 8 meters (26 feet) long that could dive to 3,600 meters (12,000 feet). It was equipped with underwater lights, cameras, a television system, and a mechanical manipulator/collector. 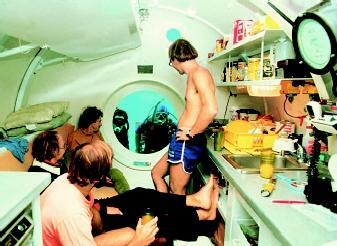 Hydrolab was home to over 600 aquanauts (from nine countries) from 1970 to 1985. Its interior held four, but only three could sleep at one time. 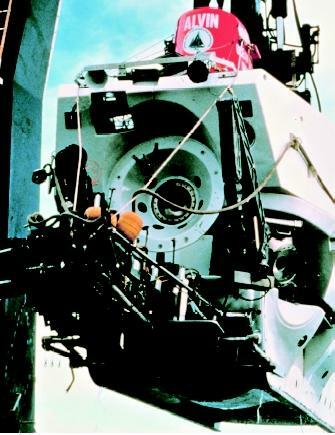 In 1975, scientists of Project FAMOUS (French-American Mid-Ocean Undersea Study) used Alvin to dive on the Mid-Atlantic Ridge for the first direct observation of seafloor spreading. Alvin was responsible for discovering the spectacular hot springs and associated sea life that occur along the East Pacific Rise. Moreover, it provided early glimpses of the Titanic wreck site in 1985. Since Alvin , other manned submersibles have been used successfully to explore the ocean floor. Unmanned, robot submersibles are also being used for underwater exploration. Capable of descending to depths of as much as 6,000 meters (20,000 feet), one such craft, called Argo , was used in 1985 to locate the wreck of the Titanic , and a smaller robot, called Jason , was used to explore the wreck. ROVs (Remotely Operated Vehicles), developed in the 1950s and used worldwide since the 1970s, explore previously inaccessible underwater. The ROV is a remote-controlled vessel that provides a stable platform for a video, still camera, and lighting system. It was first used to locate Navy submarine wrecks, but is now used by commercial and scientific groups. Alongside human divers, ROVs were used to salvage debris from TWA Flight 800, which crashed off Long Island, New York, in 1996. The latest submersibles are robotic vehicles called AUVs (autonomous underwater vehicles). These unmanned, untethered submersible robots are designed to operate individually according to preprogrammed sets of instructions. This allows AUVs to perform simple, routine tasks without human operation or interaction, such as the periodic monitoring of seabed biological growth. The DSV Alvin is shown here hoisted aboard a support ship before one of its missions. Named after engineer Allyn Vine, the submersible could descend to a maximum depth of 4,000 meters. bring cooperation between the military and the scientific community. SEE ALSO Archaeology, Underwater ; Oceanography from Space. Preston, Antony. Submarines: The History and Evolution of Underwater Fighting Vessels. London, U.K.: Octopus, 1975. Exploring the Deep Ocean Floor: Hot Springs and Strange Creatures. U.S. Geological Survey. <http://pubs.usgs.gov/publications/text/exploring.html> . Gradwohl, Judith. How DEEP Can They Go? Smithsonian Institution <http://seawifs.gsfc.nasa.gov/OCEAN_PLANET/HTML/military_submarine.html> . History of Alvin. Marine Operations, Woods Hole Oceanographic Institution. <http://www.whoi.edu/marops/vehicles/alvin/index.html> . Media Center Dr. Robert Ballard. The JASON Foundation for Education. <http://www.jasonproject.org/media_center/bob_ballard/bob_ballard.htm> . People Under the Sea: Submersibles-1960–2000. Office of Naval Research. <http://www.onr.navy.mil/focus/blowballast/people/submersibles2.htm> . Titanic Discovery. RMS Titanic, Inc. <http://www.titanic-online.com/titanic/expeditions/discovery.html> . The C.S.S. Hunley was the first submarine in history to sink a warship. After torpedoing the U.S.S. Housatonic off Charleston, South Carolina, in February 1864, the Hunley and its nine-man crew vanished. In 1997, the wreckage of the Hunley was located off the South Carolina coast.